Abdulahi Sharif Hasan walked across the border from Mexico to the United States in 2011. But his exact route to Canada remains unclear. At a busy border crossing just south of San Diego, Abdulahi Hasan Sharif walked into the United States on July 12, 2011. He had no documents and no right to be there. Almost immediately, he was turned over to Immigration and Customs Enforcement. It's not known exactly what route the Somali refugee took to reach the U.S. border. He is now in the Edmonton Remand Centre after being arrested over the weekend and later charged with 11 offences, including five counts of attempted murder. 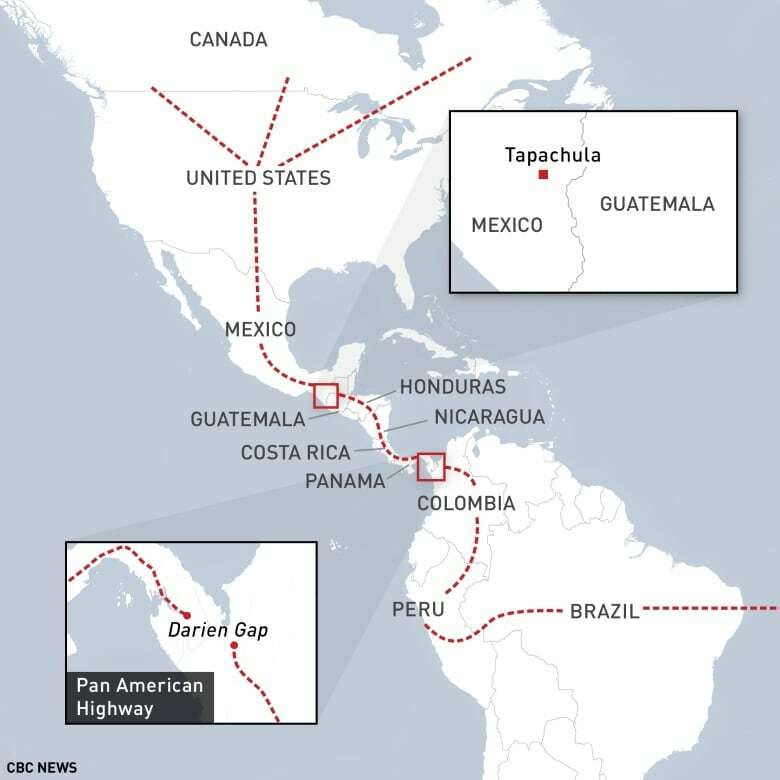 The flow of migrants from Africa to South America, and then to North America, has become a major news story in Canada over the past year. CBC has reported on African migrants who have travelled by foot, bus, boat, and train on a journey to Canada that can take months to complete. Some have Canada in mind as their final destination, while others end up here if their asylum claims are denied in the United States. What happened after Sharif was taken into U.S. custody is unclear; American officials won't say if he actually made an asylum claim in that country. But U.S. Immigration and Customs Enforcement has confirmed that just a few months later, on September 22, 2011, an immigration judge ordered Sharif removed to Somalia. Sharif never appealed that decision. "A deportation gets issued but it doesn't get executed right away," said Michael Greene, an immigration lawyer in Calgary. "If they're considered not a danger to the public and not a flight risk, they release them — it's one of the reasons they have some 11 million illegals in the U.S."
Sharif, 30, is currently in custody after allegedly stabbing a police officer in Edmonton and plowing into four pedestrians on Jasper Avenue on Saturday night. Sharif's path to the United States was somewhat unusual for Somalis, said Michael Davis, an immigration lawyer in Minneapolis, which is home to the largest Somali diaspora in the world. The vast majority of those Somalis arrived in the United States as refugees, Davis said. That means they had been screened and approved for refugee status before entering the United States, and had permission to be there upon arrival. For those who do claim asylum after arriving on American soil, the likelihood of being accepted is low. About 55 per cent of Somali asylum seekers to the United States were denied asylum between 2011 and 2016, according to the Transactional Records Access Clearinghouse, a data research centre based at Syracuse University. If Sharif did make an asylum claim, the record or the reasons why a judge would have denied it are confidential. "You can't look at an asylum record," Davis said. "They're strictly confidential, for obvious reasons." He also noted that claims can be denied for a variety of reasons — whether someone claims asylum past state-set deadlines or if they've been involved in criminal activity or if their claim of persecution isn't believed. Officials in the U.S. have said Sharif had no known criminal history when he was picked up by ICE. At San Ysidro border crossing where Sharif arrived into the United States, cars queue for kilometres along the mega-highways on either side. So do throngs of people, looking to do a quick day trip to Tijuana or to reach their jobs in California. In January 2012, months after Sharif had been released from U.S. immigration custody, ICE lost track of him. There are millions of undocumented people in the United States and it appears that, for a few months at least, Sharif was among them. ​Canada accepted about 90 per cent of asylum claims from Somalia in 2012, according to documents from the Canadian Council for Refugees. Some are asking why Sharif could claim asylum in Canada after he'd been ordered deported from the United States. But it's unclear if he ever actually applied for asylum in the U.S. If he did and he was denied, it would be much harder to make a claim here, let alone have it accepted, said Greene, the Calgary immigration lawyer. Under the Safe Third Country Agreement, immigrants must claim asylum in the first country where they arrive — in Sharif's case, that would have been the U.S. But there are some exceptions: namely if someone has a relative in Canada, or if they are a minor. But Greene stressed that he's unfamiliar with Sharif's case. "It's quite possible he never claimed asylum there," he said. "Normally, if someone claims asylum in the U.S., it's quite hard for them to win it here. But you've got a bit of speculation there about what happened in the U.S."